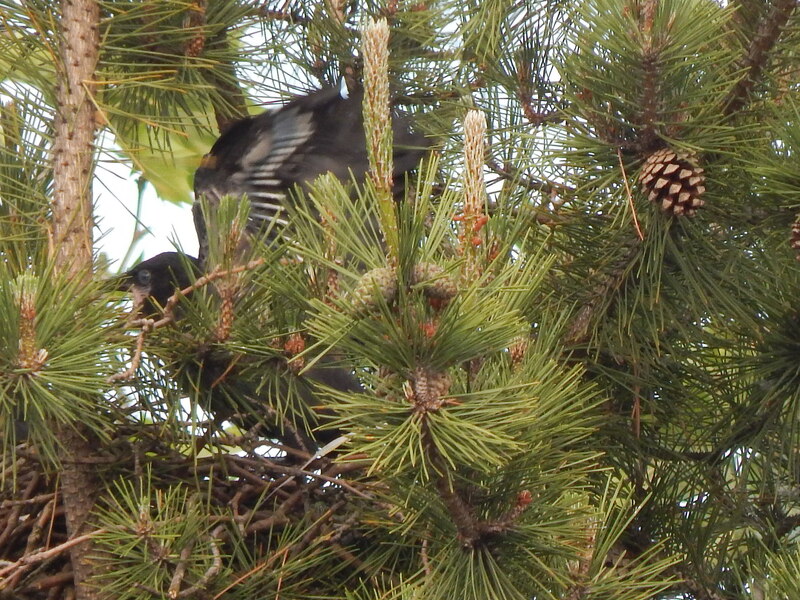 The Renton Crow nest outside my window is getting a bit crowded. 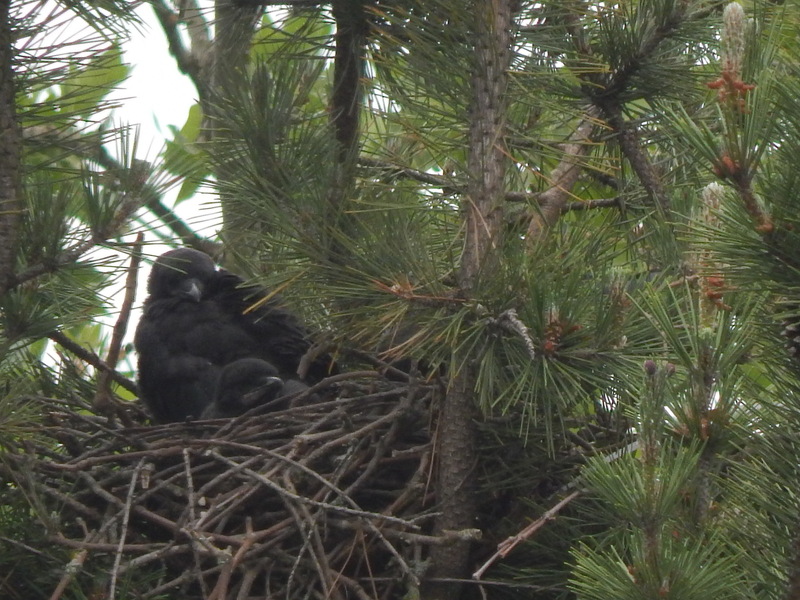 Two baby crows and parent are starting to push the limit of the stick basket the parents built. 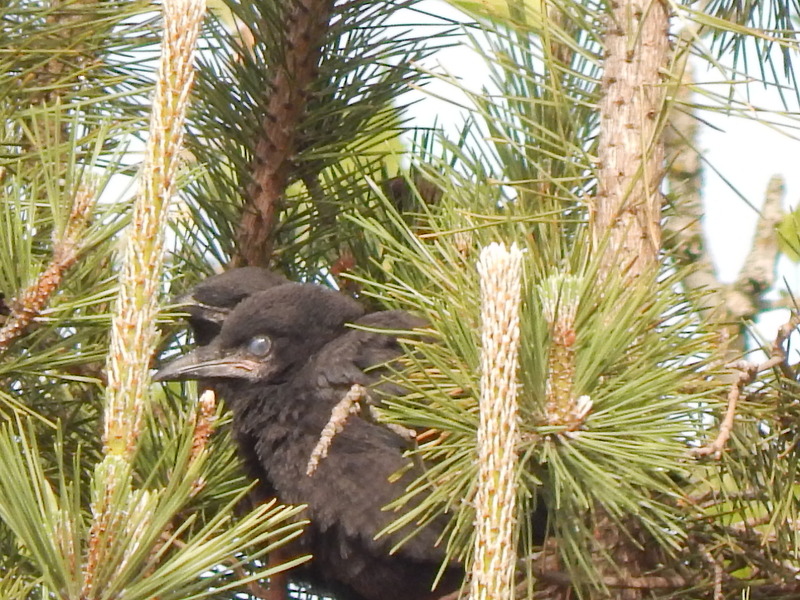 My baby crow math has them at about 4 weeks old and have about another week to go before they adventure out onto the tree limbs. If you eyeball them next to their parents they do seem to be about 3/4 adult size or maybe even bigger than that. Imagine having to share this little space with your baby brother/sister for another week while stretching and flapping your wings. This week I got two good videos of the activity. The first is from Tuesday 5/29 my first day back after the holiday weekend. They are busy preening and picking at their feathers. They still have this waxing tube like thing over some of their feathers (called a feather sheath). This needs to be cleaned off. Fast forward to Friday 6/1. I swear every day they get bigger, less fluffy and their beaks start to be the right size for their face. I think of baby crows feet and beaks like puppies and kittens. They too have oversize paws to their body size. Kind of goofy cute! 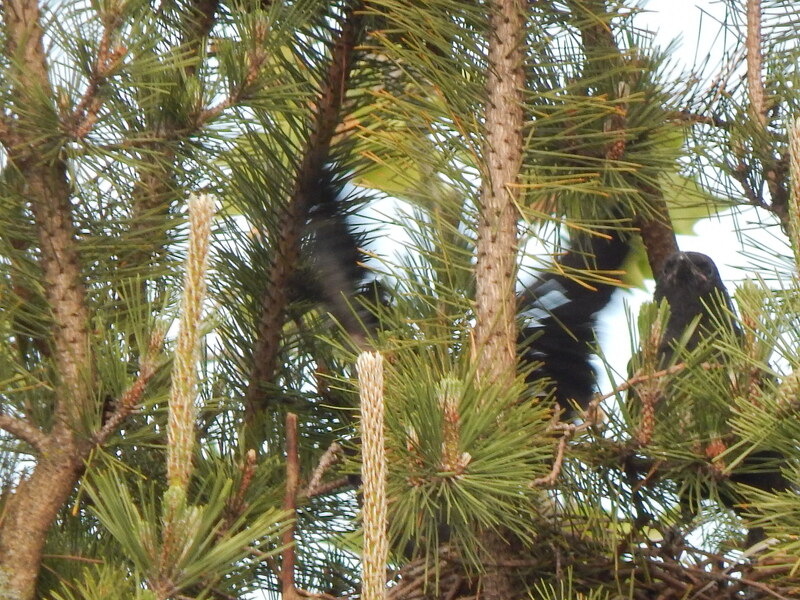 One of them is in serious training by stretching and flapping. When mom shows up he gets even busier. Kind like he has to show off to her that he is ready to leave the nest. You see she is pushing them to fledge. 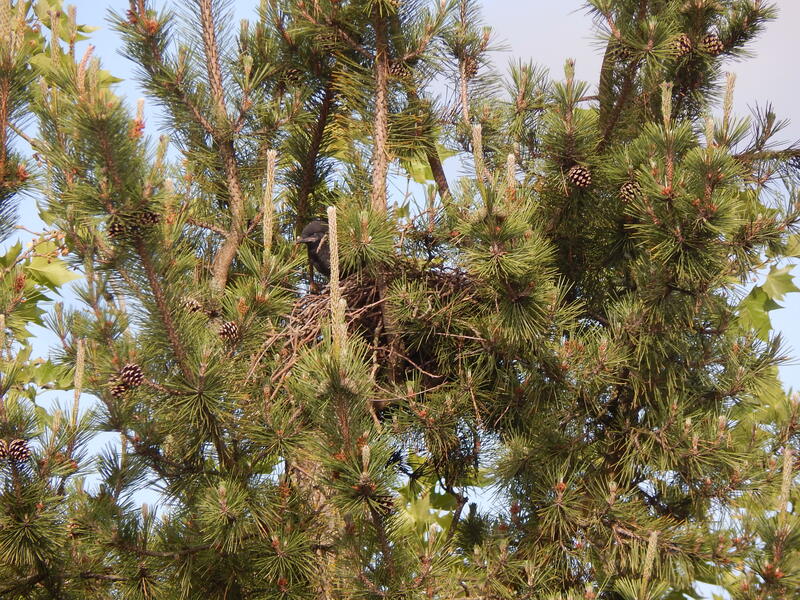 It is not that safe in the nest and by moving them to different places every night the parents are increasing their chance of getting their babies to adulthood. Here is a series of photos showing their cuteness throughout the day. 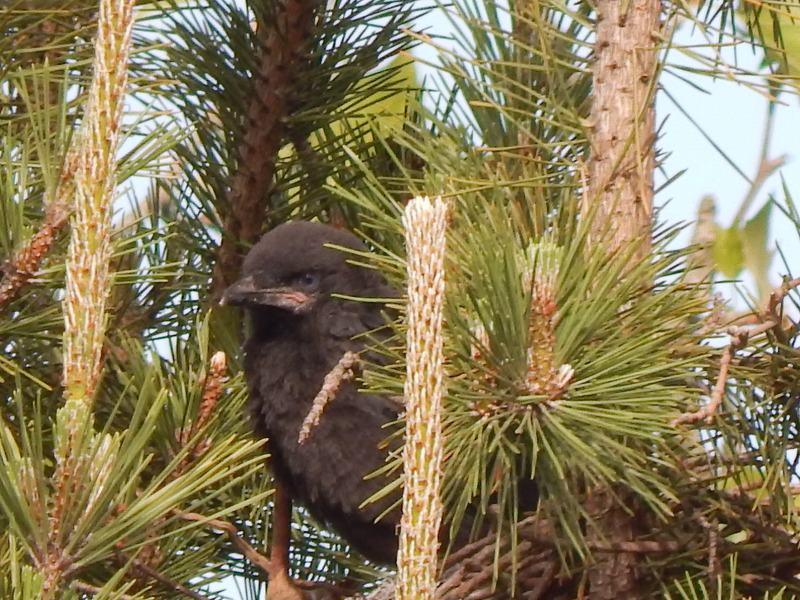 Fluffy Baby Crow in Pine Tree Posing – see sibling behind the boughs? 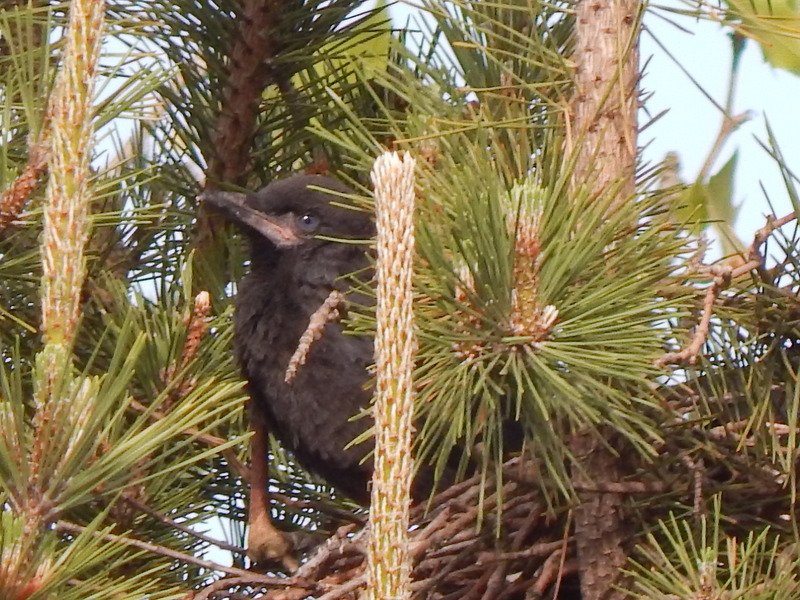 Baby Crows – which is older by a few days? Hard to tell. Fluffy and downy feathers show well in this light. Good look at the pink mouth which is a giveaway that this is a young crow. 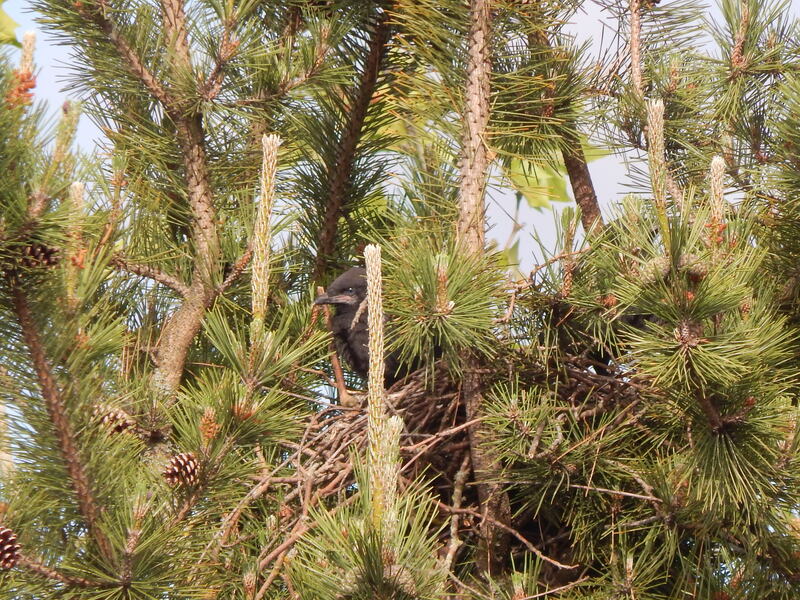 Dang this nest is getting small mom! Check out the waxy coating on the baby’s wing feathers. So, another week in the crow nest passes. Next week I hope we will see the babies get even more active and show off the skills they are practicing this week.